For many people, the ideal vacation is one spent surrounded by sea and sand, but leaving the coastal life can be difficult once you fall in love with it. If you’re not ready to invest in a condo or beach home but love the seaside lifestyle, bring a vacation vibe into your daily life with a few simple designing tips. You might find yourself pining away for the surf a little less until your next visit. Blue and white are the characteristic colors of many beach homes with a bright, breezy feel. Choose accents and accessories in soft whites and navy blue, but don’t forget other shades as well. Neutral, earthy hues like tans, browns, and light grays go well with aqua and sea foam green. Don’t forget about incorporating stripes as a nautical element in your decor. Beach-inspired interiors are all about the textures. Choose furniture, rugs, window shades, and accent pieces in rattan, rope, jute, and teak as a salute to the sea. Because of their brown nuances, they are flexible enough to complement and match any ocean palette. It’s a versatile style that leaves plenty of room for inspiration—it’s up to you how far you take the oceanfront look. 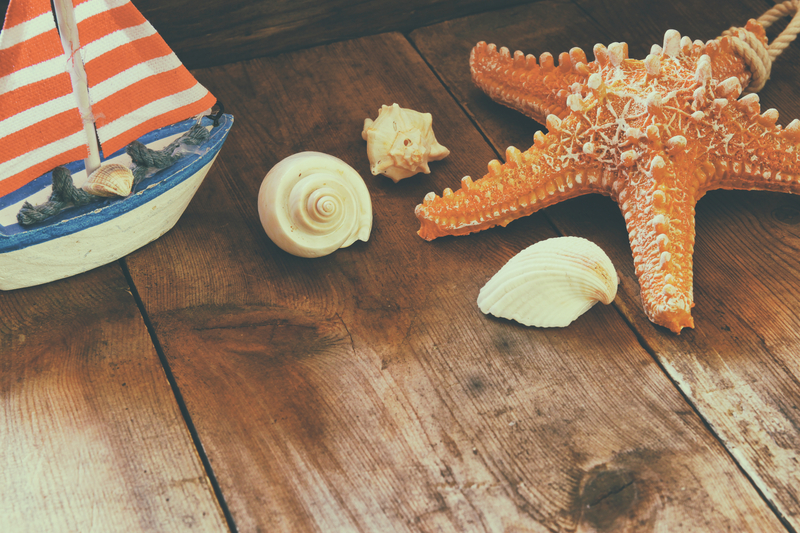 Beach homes are often filled with trinkets and curios from the ocean, so take out those shells, bottles, and weather-worn pieces for seaside-inspired decor. Display shells on the walls or use them as a holder for small succulents. Fill old bottles with sand and shells, and wrap jute strings or rope around them for a bit of nautical flair. And if you have sailboats, fishnets, or lobster traps, use them without going overboard. If it’s too hot to spend time outdoors, bring some of your porch furniture in for a laid back vibe indoors. Create a nook or comfy sitting area where you can relax, read a book, and take time off from your gadgets. Add distressed pieces like boat paddles or oars as a backdrop to your wicker, wood, or rattan lounge chairs. Roll up those thick, dark rugs and leave your floors bare—just like in beach homes. But if you feel more comfy with something underfoot, pick oversized throw rugs in jute or wide stripes. Switch your upholstery covers to lighter fabrics such as cotton and linen for a comfier and more relaxed feel. Use space to your advantage, too—to keep it feeling light and breezy, avoid crowding your space with too many elements. This spring break, experience the real thing with a beach home rental along the Gulf Coast of Alabama from Sugar Sands Realty & Management. Located in Orange Beach, AL, they offer gorgeous properties at affordable rates. Call (800) 824-6462 for vacation homes or inquire online.